Just a disclaimer to start with. I am not Coeliac and I’m not on a gluten-free diet but I do know of many people who are. I recently found out that around 1 in 100 people across Europe are Coeliac and the diagnosis for coeliac disease has increased dramatically over the past 20 years. Therefore more pubs and restaurants are having to adapt their menus to work alongside this. So when The Kings Arms invited me to try their new gluten-free menu I thought it would be a great story for the blog. It can be difficult for Coeliacs to find suitable menus to fit their dietary requirements and as gluten-free menus are in demand in London I wanted to show my readers that pub menus are not out of bounds. So I popped by The Kings Arms, which is Wadworth’s flagship London pub. 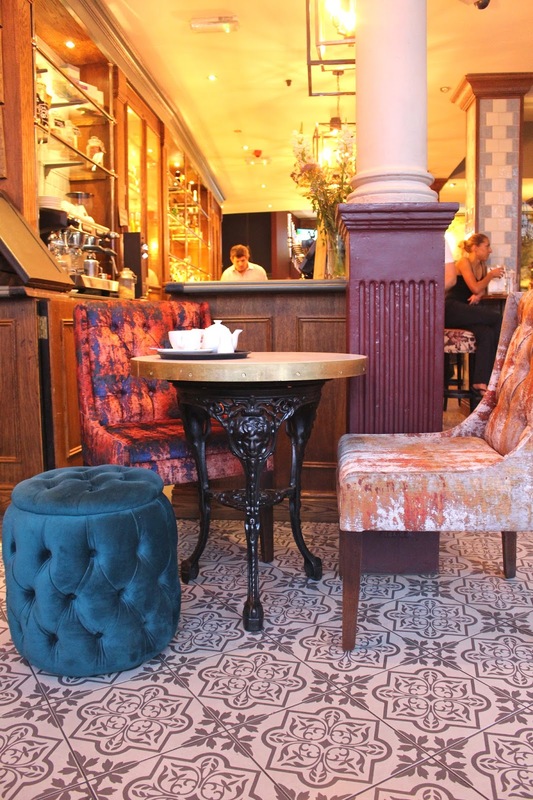 The Kings Arms isn’t any old pub, it’s recently undergone a £300K refurb on the exteriors and interiors and has a contemporary stylish design to boot. The carpet, plush chairs, banquette seating, cushions and tiling are all clashing patterns of blue, orange, teal, red, beige, and even a floral print,yet it all works so tastefully. I was very impressed as soon as I entered the door – this place beats your usual local. Wadworth is already committed to catering for those with gluten-free requirements with 45 Coeliac UK accredited Managed House pubs serving up delicious, full gluten-free menus and their Gluten-free golden ale – 6X Gold. This has just been confirmed as a permanent addition to the Wadworth range of flagship beers after an overwhelmingly successful trial period. So it was necessary that we started off with a pint of Wadworth’s 6X Gold each. An ale which promises not to compromise on quality or flavour and it certainly didn’t. This refreshing ale has a zesty citrus aroma and can be enjoyed whether you are Coeliac or not, of course. The gluten-free menu is extensive, for starters there are three options including homemade seasonal soup with bread and West Country butter and Free-range chicken Caesar salad with crispy bacon and shaved Parmesan. My guest and I both plumped for the Goat’s cheese, roasted pepper & vine tomato bruschetta with pesto. This dish was so tasty, the pesto was a great flavour enhancer to the dish. I completely forgot that the dish I was eating was gluten-free until after I had finished. I could taste the different ever so slightly in the bread but apart from that it was utterly delicious, and beautifully presented – so full of colour. The Kings Arms is a great place to take someone if they are gluten-free and you aren’t, as there is a variety of dishes for you both. For our main course we ordered the Fish of the day in Wadworth’s 6X Gold beer batter with chunky chips, crushed peas and grilled lemon and tartare sauce as well as the Steak burger with bacon and Gruyere cheese on a toasted bun with red onion jam and a side salad and chips. Both were very generous portions at a reasonable price (£11.95 each). Again, there’s a large selection of main course dishes so it was so difficult to make a choice. You can order your typical pub grub like the burger and fish chips but there’s also some fantastic dishes which shows that The Kings Arms isn’t your average pub. Other dishes include Ham served on bubble & squeak with poached duck eggs and Hollandaise sauce, Grilled halloumi nicoise salad, and sea bass fillet. Both dishes were fantastic and such generous portions. I could only taste the difference ever so slightly with the burger. It was a little dry and could have done with a larger helping of red onion jam. But it was still very tasty and the chips were great! All in all, we had a fabulous evening at The Kings Arms. 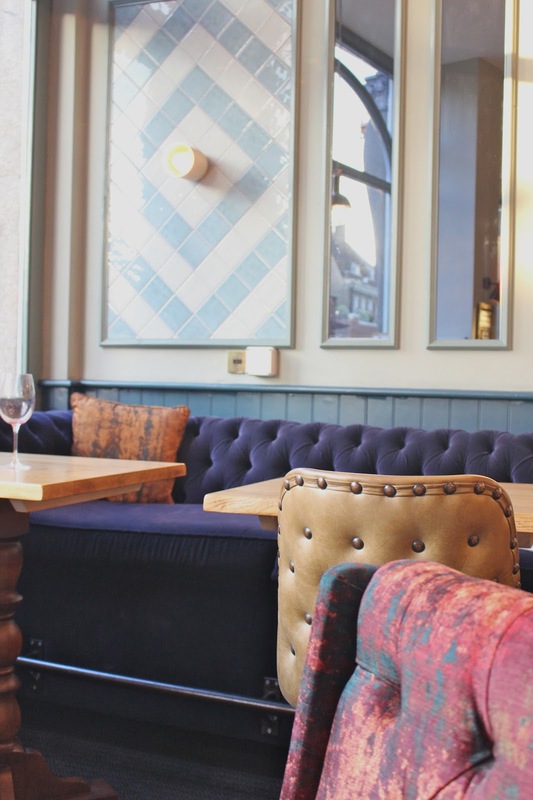 A pub with beautiful decor, a great atmosphere and good grub and drinks to suit a variety of dietary requirements – which I am sure we will be seeing in more pubs over the next few years. The Kings Arms is a wonderful place to enjoy just a drink or stay for a two-course meal. A place where you can bring gluten-free family or friends knowing that no one will go hungry. Plus, the locals are really friendly too! We even bumped into Will.i.am’s mate…but that’s another story!